National received the award at a special celebration in New York City Tuesday, honoring the top travel destinations, companies, and brands around the globe, as rated by its readers. 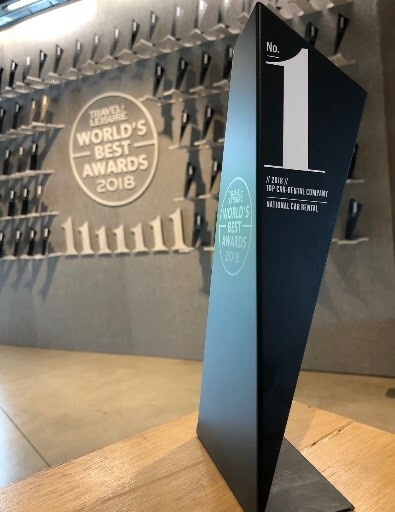 Vehicle selection, customer service, and overall value were just a few of the categories for which National Car Rental received praise, taking the top spot for the fifth year in a row in Travel + Leisure magazine’s World’s Best Awards. National received the award at a special celebration in New York City Tuesday, honoring the top travel destinations, companies, and brands around the globe, as rated by its readers. This recognition marks the 23rd year that National has qualified for the prestigious “World’s Best” list. Business Travel News magazine also recently recognized National and Enterprise for their mobile app technology, quality of data reporting, and consistent communication, naming them as the top two car rental brands in its annual Car Rental Survey for the fourth consecutive year. Enterprise Holdings’ network is built upon more than six decades of unwavering commitment to customer satisfaction, innovative technology and industry leadership. In fact, the business collectively ranks near the top of the global travel industry — ahead of many airlines and most cruise lines, hotels, tour operators and online travel agencies. As the world’s largest car rental provider as measured by revenue and fleet, Enterprise Holdings operates — through its independent regional subsidiaries and franchise partners — an integrated global network of more than 10,000 fully staffed neighborhood and airport locations across more than 90 countries and territories.